OUT NOW: The Future of Almost Everything is the Patrick Dixon's 16th book, published by Profile Books. "Take hold of your future or the future will take hold of you." Read FREE SAMPLE of the book. The Future of Almost Everything describes hundreds of key trends which will impact your business and personal life, and explains what it all means for our wider world. Practical insights for leaders and decision-makers in every industry, for government, non-profit organisations. Patrick Dixon commented: "I have managed to pack into a single book all the key messages I have been giving about the future, in highly customised keynotes, to leaders of every industry and government, from every part of the world, over the last five years - with a major focus on the next decade, but also looking in many cases far beyond 2050. "Every trend in every industry affects every other trend, which is why you need to read The Future of Almost Everything at least twice through to make sense of your entire future. It is impossible, for example, to talk about the future of retail without talking about global manufacturing trends, or the growth of online sales, which in turn are affected by things such as energy prices or use of smartphones, social media, government regulations... and so on." Order The Future of Almost Everything from Amazon. Read FREE SAMPLE of the book. 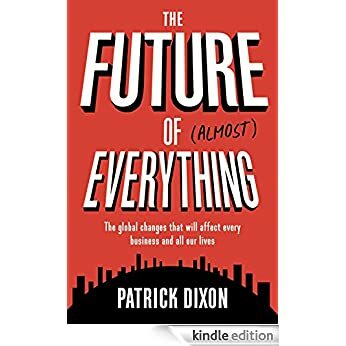 The Future of Almost Everything – book by Patrick Dixon published by Profile Books - quotes and extracts. “Our world will face many urgent challenges, mainly caused by human activity and innovation." My job is to live in the future and to see tomorrow as history. Global companies use me as a guide to the truth about life in years to come: what to expect, how to respond, how to provoke fresh thinking. Here is what I tell them, about the future of almost everything, about the things that really matter. We face the greatest threats to survival in human history, while new technologies will give us the greatest opportunities ever known to create a better world. Some decisions made today will affect life on earth for a thousand years. This is an extraordinary time to be alive. Our world is being shaken by seismic events, which are overtaking governments and corporations. At the same time, many trends are developing relatively slowly, people’s lives are evolving rather gradually, and history shows that the most shocking predictions are usually wrong. So we need to pay close attention to what is most likely and plan for the unexpected. Either you see the future as something to prepare for, or as a world to shape by your own actions. This book is therefore about being futuristic rather than fatalistic. Take hold of the future or the future will take hold of you. You may have the greatest strategy on the planet, but if the world changes unexpectedly, you just travel even faster in the wrong direction. As I learned in my first career as a cancer doctor looking after the dying, life is too short to lose a single day doing things that are a complete waste of time, or that we don’t believe in, so we need to know where we are going. 35 years ago was 1980. Looking forward another 35 years…. “Babies born in 2040 will live for an average of 110 years in many parts of the world – and this single fact will cause massive social upheaval. Most of people’s working lives will be between the ages of 50 and 85 But those 85 year-olds will feel fitter than 70 year-olds today. “Most corporations are being overtaken by events on a regular basis – competitor action, new innovations, emerging market instability, new regulations and so on…. “But many other things will change relatively slowly. For example, over the next 20 years, the use of cash will grow in most nations. Most people worldwide will continue to fall in love, get married and have children. Many of the most popular food brands will be ones we recognize today. Planes and trains will look very similar. Books, magazines and newspapers will continue to be printed and valued, especially in emerging markets. Most people will still drive their own cars, listen to the radio, commute to work and watch films in cinemas." Most debates about the future in company board rooms are not about what is going to happen – which is often obvious – but about when. * Speed of change will be a huge challenge for every leader. All strategies of large corporations will be at risk of being overtaken by events. * Digital pressure or addiction will become one of the commonest causes of anxiety, depression and mental breakdown, particularly among young people. * Most medium-sized or large companies will fail to cross the bridge from old to new: they will shrivel and die over the next two to three decades, driven out of business by leaders who are technoblind, and uncomfortable with the speed of radical change. * We will see more speculative attacks on commodity prices, short-selling stocks of companies, and attacks on the stability of entire stock exchanges. * Over 90% of all web traffic will be video by 2025 in many developed nations. * Data traffic on mobiles will increase 1000 fold in the next 5 years, on 50 billion mobile devices connected to 5G, running at 10gps. * In the UK, over 25 million people will be making mobile payments by 2020. * More than 250 million people by 2023 are likely to be wearing smart devices such as wristbands recording motion, or smart watches that integrate with mobiles. * Customers will become increasingly intolerant of complex products, and simplicity will be a core value for every successful IT and telco company. * Expect many more types of head-based displays, gesture controls – all of which will ultimately be threatened by direct digital-brain interfaces. * Biodigital brains will be a relatively normal part of life for over 25 million people by 2050, mainly to restore hearing or sight, as well as to overcome brain or spinal cord injuries, or, more rarely (for those who are wealthy and curious enough), to try to extend mental horizons, memory, intelligence, thinking speed and powers of concentration. * Most people’s online worlds will be completely dominated over the next decade by no more than 10?20 global brands. * China will dominate the web – most new web content will be written in Chinese. * The music industry will face meltdown and chaos, and many music labels will be wiped out by social media music. * Labels will continue to dominate global album sales well into 2020, but 85% of their revenues will come from a handful of ultra-successful bands. * 80-100 million people will be paying for unlimited streaming via services like Spotify by 2020 – but most musicians will earn less than $0.002 per play. * Radio stations will continue to enjoy huge audiences. * Most successful music artists will generate the bulk of their income from live events, sponsorships, commercials, celebrity appearances, and so on. * Compared to the drastic transformation in the music industry, the film industry will change rather slowly, with more mega-budget films, and astonishingly realistic imaging of imaginary creatures, worlds and events. * The film industry will continue to merge with gaming, with interactive HD animations and sequences by ‘real’ actors. * Gaming headsets will be rejected by most gamers for day-to-day use before 2025, because of eye strain, weight, lack of comfort, cost, being uncool, short battery life. * Apple will invest heavily in a rapidly growing range of wearable tech, going far beyond the i-Watch. * The Internet of Things, Big Data and Cloud Computing have all been around for a while, but the combination of all three in new ways will create the next revolution. * 30 billion different items will be communicating with each other online by 2022, rising to 100 billion by 2030. * More than 40 trillion gigabytes of data will be produced a year by 2020 – over 5 gigabytes for every human being. * Little Data will matter even more than Big Data - Big Data is about spotting a pattern, but Little Data is all about spotting a person. * Cyber-crime will be one of the greatest threats to our world over the next 50 years, and far beyond, into centuries to come. * We will see huge investments by government secret services and military into quantum computing (QC), mainly to crack strong encryption. * Hackers will often escape prosecution if caught – to save exposure of the company to public scandal. * Large corporations will be forced to encrypt sensitive data stored on their servers, not relying alone on firewalls. * It will be impossible to prove who is behind the largest cyber-attacks on corporations or governments. * Hackers will be offered huge rewards by governments to attack the so-called “dark web” – an anonymous world of untraceable activities. “The truth is that paper has a far better future than many think – books will continue to be printed and read, flipcharts will continue to be written on… the reasons are emotional as well as rational. * Sales of e-books are likely to overtake those of paper books in the UK by 2018, when at least 50% of the population will own an e-reader of some kind – even if just a smartphone App. * Sales of e-books are likely to triple in the next 5 years from £380bn to over £1bn. * Newspapers will rapidly decline in almost all developed nations over the next 5–10 years, while readership will grow in news-loving nations such as India, driven by expansion of the middle classes. * TV news stations will struggle to maintain audiences as people experience “news fatigue”, except in times of crisis. * One billion children will become consumers in the next 15 years – the biggest jump in human history. * By 2025, most people on the planet will be in Asia. * 85% of the world’s population will be living in emerging markets by 2025. * 1 million voters in Italy will be at least 90 years old by 2026 ? enough to swing every election. * 1.5 billion people will move to cities over the next three decades, in search of a better life. * Half the world’s GDP growth over the next 20 years will come from around 450 cities in emerging markets. * Half of the world’s largest 500 corporations will be based in emerging markets by 2035, compared to just 5% in 2000. * Contrasts will grow rapidly between the wealthy and the poor and this will lead to unrest. * The wealthiest 1% in our world will own 60% of the world’s wealth by 2035. * The richest 80 people on earth already own as much wealth as the poorest 3.4 billion people. * More than 2 billion people will find themselves empowered by new wealth over the next 25 years. * We will see more new infrastructure from 2020 to 2055 than in all human history - schools, hospitals, power stations, national grids, water supplies, sewage treatment, roads, railways and airports. * It is likely that there will be more than 440 million people living in Nigeria by 2050, which will make it the third largest nation on earth. * China, Japan, South Korea, the EU and Russia will all be hit by low birth rates and ageing populations. * 10 million people will move to the UK in the next 20 years, assuming no radical action is taken. * For many reasons, UK real estate is likely to remain a good long term investment. * London will continue to rank one of the most popular cities in the world to live in – until at least 2035. * London will continue to be a global centre of financial services. * More than 65% of all health spending will be on those over 65 years old in every developed nation. * 130 million people globally will be affected by dementia by 2050, up from 44 million in 2015. * Deaths from cancer, heart attack and stroke will be uncommon by 2050 in wealthier nations. * Half of the world will be obese by 2030, as more people become wealthier, and 20% of all health problems will be related to this. * Malaria will continue to be one of the world’s worst medical problems for the next 20 years, with 100 million cases a year, killing 660,000, mainly children. * Over 100 million older people in the EU will need care, at home or in an institution, in the next 20 years. * AIDS will continue to be a global menace for decades, despite better therapies. antiviral therapies, rapid vaccine development and epidemic monitoring. * Viruses will be widely used in medical treatments by 2030, also adapted as weapons of war. * Wearable medical devices will transform diagnosis and treatment. * Most pharma innovation will be by biotech companies over the next 30 years. * The price of today’s most expensive drug therapies will fall by over 90% in the next 10?15 years, as patents expire on almost all of them. * By 2025, doctors will be able to read an individual’s genetic code in less than 2 hours for less than $3000 – and compare it with millions of others to make predictions about illness. * Human clones are likely to be born in the next 20 years – raising a host of ethical and safety questions. * Printing new organs will be quite routine, using a person’s own tissues in culture, by 2035. * Stem cells will be widely used to repair heart, brain and other tissues by 2030. * By 2030, newborn babies in middle class families will have a life expectancy at birth of more than 110 years. * Serious attempts will be made by 2035 to arrest the natural ageing process in humans, using lessons learned from a variety of non-ageing animals. * Growing success in repairing spinal cord injuries will open the door by 2040 to experiments with head transplants, for those who need to acquire a new body to stay alive. * The Eurozone will not survive without further pain and unrest. * Expect a further vote on Scottish independence in the next decade, especially if the UK as a whole decides to leave the European Union. * America will continue to have the strongest military capabilities for the next 25-30 years, despite rapidly growing military spending by nations such as Russia and China. * Traditional marketing is dead – the best products and services will to some extend sell themselves through personal recommendation / social media. * Most products will fall in price in real terms over the next 30 years. * Trade between emerging nations will grow very rapidly. * Use of robots will grow more slowly than many have forecast. * In most developed nations, over 70% of all retail spending will be accounted for by just 7 companies or less. * e-commerce will hit $5 trillion by 2025, with total fusion of online and offline shopping. * Many online retailers will start offering same day delivery at a premium price. * Profitability of banking will recover – as society comes to recognize that we need people to invest in banks. * Expect rapid growth of peer-to-peer lending, worth $25bn a year by 2020, $60bn by 2025, saving at least 1% on interest rates from banks. * At least 1 billion people will gain access to banking for the first time using their mobile phones, by 2030. * Despite new payment methods, use of physical cash will grow in almost all nations until well beyond 2025. * Telcobanks will give away mobile devices and free bandwidth plus calls, so long as their devices are used for all personal payments. * Many banks will struggle to keep pace with changes in customer technology and innovation. * Fund management will be responsible for a new mis-selling crisis at some point over the next decade, with fines and lawsuits likely to be so large that they will break some of the world’s largest investment banks. * The insurance industry will grow rapidly in emerging markets – led by health insurance products. * The greatest growth in the travel industry will be in Asia. * China will dominate high speed rail globally. * Business air travel will grow despite widespread use of video conferencing and collaborative tools. * Budget airlines will carry most air passengers in Europe by 2030. * Most planes will look almost identical in 25 years time. * Numbers of cars on the road globally will treble in the next 40 years. * Sales of electric cars will boom in the next 20 years, some with ranges of more than 450 miles per charge. * Self-diagnosing, self-repairing and self-driving cars will be common within 25 years. * Space tourism will grow as a new hobby for the ultra-rich but space colonies on other planets will not be commercially viable for at least 100 years, despite subsidized experiments. * The leisure industry will see huge growth of holidays promising adventure, exploration, risk, new skills or culture. * Huge numbers of traditional holiday companies, travel agents and other brokers will be wiped out by smart websites and Apps. * University education will be dominated globally by India and China, who will each produce many times more high-quality graduates in many disciplines than the rest of the world put together. * We will see many new radical groups emerge, who use violence to promote their cause. to bring about inter-connected theocracies as part of an Arab-wide Islamic region. * Sunni and Shiite Muslims will continue as distinct communitieswell beyond 2050, with ripples felt across the entire world. * Saudi Arabia is likely to remain a major target for Islamic revolutionary forces over the next 20?30 years, and the royal family is likely to make concessions to help maintain stability. * Despite public perception, lifetime risk of being killed in a terror attack will remain far smaller than being struck by lightning – unless you live in a conflict-torn nation. * For 10 reasons – most democratic governments will lose powers over the next 20-30 years. * Sustainability will be a dominant theme for the next 300 years. * Our world will never run out of oil or gas – because as prices rise, more can be extracted, proven reserves are growing every year, and future generations are unlikely to want to burn all that carbon. * Gas power will be widely used in 2050 to balance green tech such as solar and wind. * Over the next 30 years we will see over $40 trillion spent in green tech innovation. * Solar power could become the world’s largest source of electricity by 2060. * China will dominate the wind power industry. * Millions of electric car batteries will be harnessed to store energy at peak production times. * Barring another nuclear disaster, we will see a global boom in nuclear power stations. * Hydrogen will not take off as a major fuel for vehicles. * Biofuels will become unpopular, because their use tends to increase land and food prices. * Carbon capture and storage underground will be used widely by 2045. * By 2025, two-thirds of humankind will live in areas where there are water shortages, up from one third today. * Water demand will increase by at least 40% in many emerging nations by 2040. * Expect water wars by 2040. * Millions of new jobs will be created in service industries, offsetting automation in manufacturing. * Offices will continue to be popular, although space per worker will fall with hot-desking. * Pure home-working will continue to be relatively unusual, while numbers working 1-2 days a week at home will grow rapidly. * Abolition of retirement age will encourage older people to work longer, and also create complex management issues where performance of older workers is being questioned. “As recent scandals have shown, we urgently need global agreement on what it means to act in an ethical way… Here is the ultimate ethical test by which every business and government leader will be judged, the basis of every mission statement, of every corporate value, and of all motivation…..
* Corruption costs at least 5% ($2.6 trillion) of global GDP. * The ultimate ethical test in many situations will be do I believe in what I am doing / selling? * The ultimate ethical value will be does this action help build a better world? * Compliance with the letter of the law will no longer be enough to protect brands or careers. * The role of non-profit organisations and social enterprises will grow globally. * Robots will also need to be programmed with an ethical code. * Euthanasia is likely to become widely accepted in many nations as normal, over the next two decades. * Personal spirituality and organized religion will dominate ethical thinking globally. * Global governance will grow in strength out of hundreds of international agreements, alliances, forums and organisations, increasingly dominated by emerging markets. - The future of the global economy: where growth will come from over the next 30 years and why. - The future of globalisation, manufacturing trends and supply chain management, future of logistics including shipping, and ways to reduce risks. The future of robotics in manufacturing. The future of offshoring, onshoring, nearshoring and why many millions of manufacturing jobs will return to developed nations from places like China over the next two decades. - The future of the European Union, future of the Eurozone, and of other trading blocs. The future of the UN and of global governance. - The future of emerging markets - with special focus on India, China, the rest of Asia, Russia, Africa, the Middle East and Latin America, emerging middle class and demographic changes. How the world will look in 150 years - with complete rebalancing of economic, political and military power. - The future of health care: transition from treating sick people, to prevention, to performance enhancement and what we can learn from animals that do not get old - some of which live for over 400 years. Future of hospitals and home care, pharma and biotech, medical technology, diagnostics and gene analysis. - The future of relationships of all kinds, different types of families, models of marriage and parenting. The future of communities, cultures and creation of new tribes. Why patterns of drug and alcohol abuse are changing. Future of crime and law enforcement. - The future of retail, mobile consumers, fusion of online and offline shopping experiences, future of shopping malls, convenience stores and niche outlets. Future of the fashion industry, new textiles and the cotton industry. - The future of digital including quantum computing: how Big Data, Cloud Computing and the Internet of Things will merge to create the greatest transformation in digital tech for 20 years. Impact on your own personal life and on every business. Future of home automation, office automation. Growing threat from next-generation cyber-attacks as a result of all this centralisation of information and digital power. - The future of banking, insurance and every other kind of financial service including stock exchanges and all other kinds of markets. The future of telcos, and why the old telco business model cannot survive much longer. The future of telco-banks and who will "own" the customer relationship. How more than a billion unbanked people will discover financial services for the first time in the next 10 years using a mobile device. - The future of food and beverages industries - changing customer preferences, how grocery / food outlets must adapt to survive. Impact of new regulations in the food industry. New patterns of consumption, new tastes and new types of food. - The future of marketing, advertising, brands, viral campaigns, location-based messaging, customer loyalty and engagement. Why traditional marketing is dead and what is already rising up to replace it. - The future of the auto industry: next generation smart cars, robot drivers, networked vehicles, new fuels and propulsion systems. - The future of aviation, space travel, space colonies, business travel, holidays, hotels. - The future of entertainment and leisure: trends in the music and film industry, TV, videos, radio and sport. Expect many surprises. - The future of news gathering and publishing: future of TV news channels, future of books, newspapers and magazines, future of online media channels and digital publishing - and why paper will survive much longer than most think. - Why large cities have a great future, future urbanisation, massive migrations and real booms and busts. What kind of cities and offices will we need? What kind of infrastructure will we build? Who will be the winners and losers in developing these new cities? - Changes in workplace and the nature of paid work itself: future of workplace automation, the place of robots in tomorrow's world, and where the next 3 billion new jobs will come from. The future of knowledge management and talent management, future of retirement and complexities of managing and older workforce. Why diversity at work will become more important. - The future of single issue activism. The growing impact of campaigns, pressure groups, social media on governments. Future of extremist groups, terrorism. - The future of energy, carbon use, water use, forests, farming, fishing, sustainability, global warming and the wider environment. The $40 trillion green tech boom and how we will develop the innovations to protect our future at affordable cost. - The future of leadership, change management, strategy, consultancies, accountancy and the law profession. - The future of education: revolutions in schooling and at university and why many of today's learning methods are no longer fit for purpose. - The future of government - and why democratic governments will become weaker. Future of autocracy, theocracy and other forms of government. - The future of war: and why traditional wars will mostly be replaced by hybrid conflicts, which are easier to fight and harder to resolve. Impact on military strategies and defence spending globally. - The future of religion: future balance of influence between major global faiths, and trends in personal spirituality, as part of the search for meaning. - The future of personal values, motivation and inspiration, corporate ethics, social enterprises, non-profit organisations and philanthropy, regulation and compliance - and the ultimate ethical value for the next 60 years. Here is the Google searchable version of The Future of Almost Everything. I wish know if the book THE FUTURE OF ALMOST EVERYTHING was translated to spanish language. If it is the case, where can I buy that book in spanish edition? Sorry not yet available in Spanish.